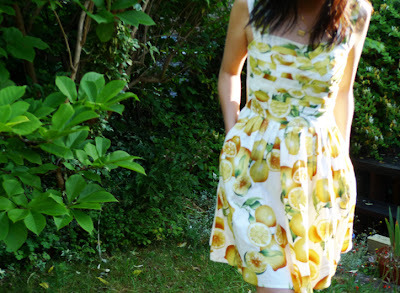 One is a citrus-print cotton tunic dress by British designer Stella McCartney. The other is also a citrus-print cotton dress, by another British favourite: Primarni. But while the former will set you back by £337.50 (and that's the sale price, reduced from £675), the latter gives you change from a tenner. Yep, this Primark special is just £9. 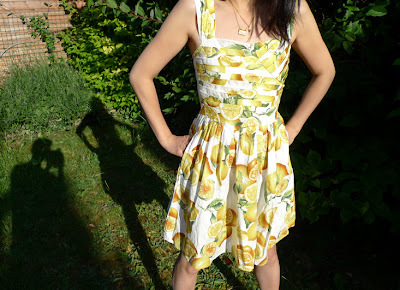 The shirred elasticated back ensures a perfect fit, but you might need to go up a size to actually get in and out of this dress (I couldn't get my usual size past my shoulders!). I love its 1950s style and the hidden side pockets (always a bonus in a dress, I find). A bold, cheerful print, it's great for working this summer's colour trend. Accessorise with bright bags and shoes (think pink, red, green, blue…) or go classic with tan. It comes in black, too. … and Stella, Primark, New Look, River Island and Dorothy Perkins, too! Yes, check out the citrus brights from the latter three stores as well. Meanwhile, if the Stella tunic's for you, here's the link. That dress is beautiful, great for the summer.